Myanmar (Burma) is a remote country in Southeast Asia. It’s a country that is isolated from the rest of the world for both geological and political reasons. Travelers here are rewarded with very friendly people, and a culture set apart. The years of isolation mean that Myanmar is one of the only places you can still experience true “old Asia” culture. Myanmar has had some recent elections and I’ve had a friend ask me about traveling there, so it’s a place that’s been on my mind. I went through some old images that I photographed there, and thought I’d share. This is just a beautiful sunset that I was lucky enough to witness in a beautiful part of the world. This is U Bien's bridge, near Mandalay, Myanmar. Sunrise on the World Heritage site of Bagan, Mynamar (Burma) Bagan is a UNESCO World Heritage Site. It covers an area about 7 km by 7 km and is packed with 7000+ pagodas. It was one of the world’s greatest cities from around AD 850 until it’s demise around the 13th century. Friendly Burmese minority girls on a train from Mandalay to Hsipaw, Myanmar (Burma). 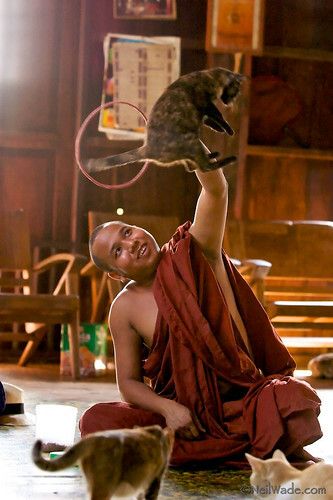 Inle Lake, Burma (Myanmar) Monks train cats in this remote Burmese monastery to jump through hoops for tourists. 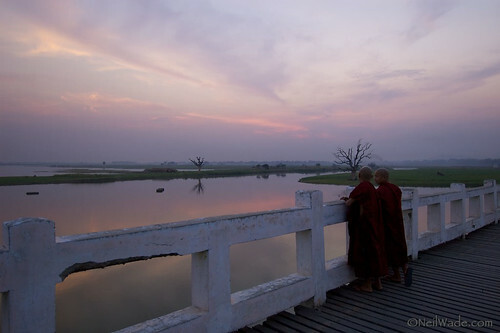 Two Buddhist monks chat as they watch the sun set on U Bien’s Bridge near Mandalay, Myanmar (Burma). 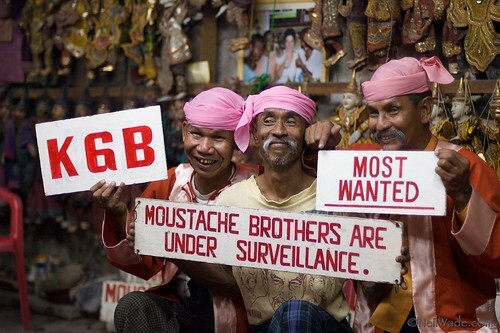 The famous Moustache Brothers have been jailed many times for their anti-government comedy. Mandalay. Walking on a trek through the hill villages near Kalaw, we kept hearing about a carnival that was nearby. When we eventually found it, there wasn’t much to see, just a few food stands and games to gamble on. These novice monks are betting on a game of huge dice. 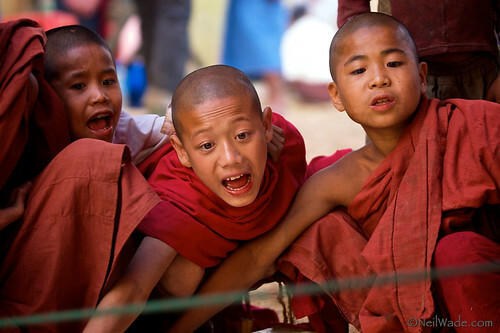 Betting is a big no-no for monks, but I guess at a once a year carnival, you gotta let the kids be kids. 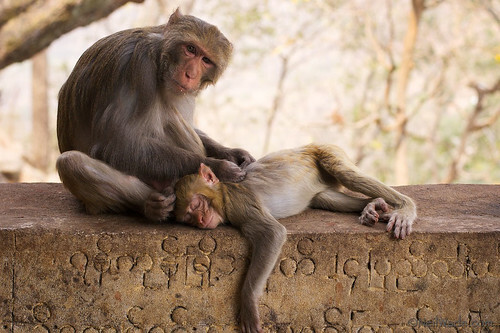 Monkeys grooming at Mt Popa, Myanmar (Burma). Mentally handicapped children are a huge burden on families in third world countries. This boy is lucky enough to live in a nunnery that cares for him. He spends most of his day ringing this huge bell for tourists…he doesn’t want any money, he just enjoys ringing it that much. 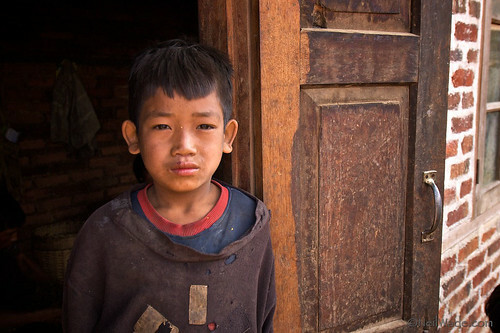 A young boy in a remote Burmese village. 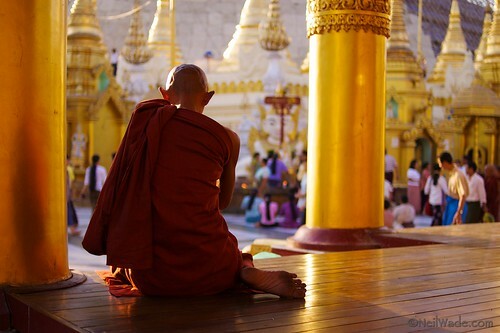 An elderly Buddhist monk meditates at busy Shwedagon Pagoda in Yangon (Rangoon), Myanmar (Burma). 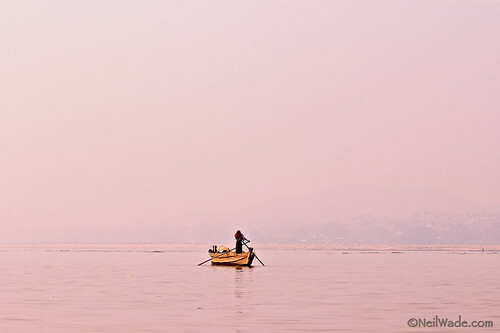 A lone boat sails down the Ayeyarwady (Irrawaddy) river near Mandalay, Myanmar (Burma). The white haze in the air is actually smoke from the rampant use of slash and burn farming in the area. To read more about the plight of Myanmar, have a look at the wiki page. I’ve gotten a lot of questions about “What camera did you use?” I’m very happy to tell you that all of these photos are over 5 years old. All are shot with an (ancient) Nikon D70. Lenses used are: a Sigma 10-20mm f/4, a Nikkor 35mm f/2, a Nikkor 50mm f/1.4, and a Nikkor 80-200mm f/2.8... I hope this goes to show that you don’t need the most expensive equipment to get good results! Basically, Myanmar is a stunningly beautiful country with some of the most friendly and sincere people I have met in all my travels. The sites are just as beautiful. The few photos that I have above are just a small sampling of what the country has to offer, there are many more beautiful places to be seen. Unfortunately, all this beauty is ruled by a horrible military dictatorship that refuses to give up control. The government brutally crushes even the smallest opposition through imprisonment, torture, and murder. Even those that don’t pose a threat can find themselves as forced labor in the “development” of the country. Myanmar is in the news right now because of the first “elections” to be held in 20 years. The last elections were a landslide victory for Aung San Suu Kyi and her democratic movement, who were never allowed to take power and weren’t allowed to run in this election. But despite all the terrible doings of the government, Myanmar is a beautiful place to visit. The people are warm and friendly and show a dignity and openness that make you forget just how oppressed they are. They are hungry for knowledge and interactions with people from the outside world are truly a treat for them. Traveling in Myanmar is definitely not for the faint. The roads (and buses) are in terrible shape. It takes about 18 bone-crushing, sweaty, dusty hours to make it from Rangoon to Mandalay on a bus. There are two paved roads that lead from the south to the north and most travelers take them in a clock-wise or counter-clock-wise route to see most of the attractions. Accommodations are fairly easy to find with a travel guide and the food is generally pretty good. I spent one month there and could have easily spent three. Don’t even plan on going if you can’t stay for more than two weeks… you will really regret it. Don’t worry about money, I only spent $400USD in a month and I really wasn’t trying to save. You have to go to Bangkok to get a visa then fly to Rangoon from there. There are domestic flights in Myanmar, but I’ve heard they have one of the worst safety records in the world. Also, I’ve heard that the airlines and train (don’t even think about it) are owned by the government, so if you use them, you’re giving money directly to the dictatorship. Honestly, if you LOVE to travel (and don’t mind roughing it), Myanmar should be on the top of your list of places to visit. In Asia Myanmar is one of the beautiful country. You bring the whole culture of Myanmar by this few picture. Nice work and i appreciate it. After seeing all of this now i am thinking to go there. It is a really beautiful country. I will warn you that, if you go, you should give yourself a lot of time. I spent a month there and could have easily spent many more! I agree with Falak, your photos really makes me want to go there and see it! Your pictures are gorgeous. Simply gorgeous. I knew a guy whose family had to leave there. After seeing these photos I can only wonder what it was like for them to endure their first winter in Chicago. I love that first picture…it’s beautiful! Actually, all of them are great!! Oh yeah, I had them jump on me, hiss at me, and everything else (except throw feces, TG)! I got a few good ones, though! Thank you! These are all shot over 5 years ago. I was using a Nikon D70 at the time. Wow…beautiful photos! Your camera really captures color well! Amazing. Thank you so much for sharing. So beautiful and vivid! Well worth a look — and, I imagine, a visit. All these photographs are amazing. Hard to set just one as a favorite, but the third one catched me. Wow, the pictures are just so GREAT! I love looking at your blog! In Myanmar, I didn’t have too much of a problem with that unless I was at a famous tourist destination. Most people seemed excited enough to see their image on the back of a camera… but that was a few years ago. Kalaw, Bagan and Mandalay should be very nice. Nice pictures! I went to Myanmar a few years ago, so your pictures brought back memories. Wonderful work and I appreciate the marriage between the photography and the written word. It’s been a quest to visit the region and your blog makes it possible for now. ” Sunrise on the World Heritage site of Bagan, Mynamar” will stand the test of time, just a beautiful image. The first photo, is just awesome! One thing is the camera, another is location, and finally you’re left with talent–which you obviously have! Amazing images! Gorgeous photography and an awesome look into a place I can only read about going to. Thank you. Beautiful. Simply Beautiful. Thanks for sharing. Wow Neil, your photos are amazing. My country never looked better. It’s been 10 years since I was last there and looking at your photos make me want to go back for a visit, this time to really enjoy it because I was too young to appreciate it at the time. Thanks for putting them up! Oh and I’ve sent the link to my dad – he’s there now visiting my gran and both my dad and I are into photography so he’ll be pleased to see your blog. These photos are beautiful. I love how the shadow and the light are at just the right combination. And it’s definitely true that cameras don’t always have to be the latest updated: mine’s ancient though I don’t take good photos. These photos are amazing! I was just teaching about Myanmar the other night. One of my students this past spring lives there. Really great stuff. yes, nice photos of a beautiful country i hope to visit someday. of note that since the vietnam war hearings of senator frank church, still largely secretized, when he called it “the golden triangle war for control of the opium trades billions” and before, burma has been a drug-lord protectorate of the CIA. in fact, some years ago, a DEA plane went down in flames after leaving burma and heading back to make a report to congress… and it was said that it was actually CIA who had them hit… who has overthrown the most democracies and backed the most brutal dictatorships in history? the US of A, tragic as that is. and the drug war is part and parcel of that. A-mazing photos! What a beautiful way to capture Myanmar. These are some really beautiful pictures. I love the captions too – too often people show their pictures, especially of other countries or things most people have never had the opportunity to see, and you don’t really understand the context. This was amazing… so glad you were Freshly Pressed! Wow… What a blessing it must have been to see all that in the moment. The quality of the blue alone is stirring! Wow…beautiful photography. The blue sunrise is gorgeous! Too bad this country is such an oppressive dictatorship. stunning photos! 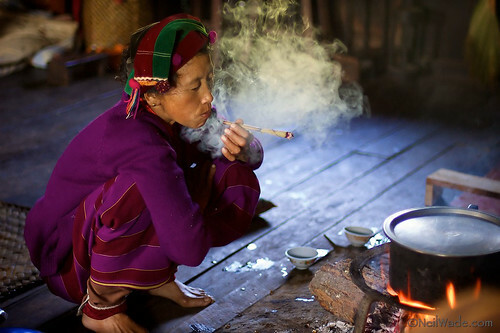 i’ve just discovered the world of travel photography and myanmar is something of a holy grail. i’ll be following your blog! Simply beautiful. Thanks so much for sharing. Stunningly beautiful and a reminder that other values and cultures matter too. Beautiful, truly emotive photos. You really captured the soul of Burma. One of my dearest friends is Burmese and I can only say that she is one of the most incredible people I know. I’m glad that this post got put on the front page, your photographs are amazing, Neil. I really like the composition, lighting and the photos you chose to share. The sunset in Myanmar reminds me of the beautiful one I saw when I visited Kota Kinabalu (Borneo) in April. What do the Moustache Brothers talk about that gets them jailed? How do they keep their comedy going despite the gov’t trying to silence them? Thank you. Yes, they still talk about the government and the corruption. When I was there, they performed in a small room in their house. They were still under surveillance, but continued with their comedy anyway. They are a true inspiration. Thanks for a glimpse into a beautiful place with beautiful people! What an amazing collection of photos! Myanmar is definitely on the list of places I want to see, but your photos have moved it up several notches. Great photos. love the blue sunrise shot. Tremendous pictures. Attracted to see it own eyes. Tremendous pictures. Defenitly I will visit the place. I wish that I could travel and take photos. I liked the monkey photo….all in all though, they were all great. Very impressive images! Thank’s for sharing! Keep it green and put MyTree on your screen! Breathtaking, Mr. Wade. You are very talented photographer! 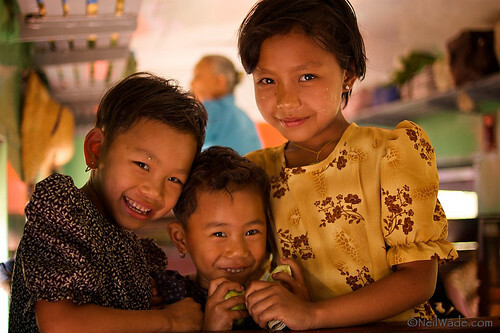 Each of your photos has captured the essence of Myanmar. I was reminded of where I come from: India (co-incidentially, the neighbour country of Myanmar/Burma). I do write some poetry/poesy about India. But your pictures are truly worth thousands of words. lovely photos Neil, these belong in a magazine..
and i really got a kick out of the Moustache brothers! but my favourite is the one of sunrise in Bagan. Wonderful pictures. I loved the photos of the mustache brothers and the monkeys! Wow…. love how you “bring” me into the picture too…. :) great shots! Beautiful country, and beautiful photos! Mingalaba! I love the pictures. You brought Myanmar alive! Thanks for sharing..
Beautful work, thank you for sharing. Great pics. You really captured the soul of the people. Thanks for sharing them with us. Myanmar (Burms) isn’t as isolated from the “entire world” as many in the West believe. India, China, Singapore, Australia, Japan, South Korea, Thailand, Taiwan, Vietnam, Laos, Cambodia, and other Asian nations trade and do business with Myanmar. Many of these nations also invest in Myanmar. Myanmar’s isolation is more with Europe and North America due to Western sanctions on the country. breathtaking . . . thank you for posting them. I am amazed at these pictures. I am newly inspired to travel to Burma. Wonderful photos. I especially liked the one of the monkeys! really awesome pictures. it was nice seeing these pictures because im half burmese.. and ive never gotten to see burma.. or learn any culture .. (besides the food!) Thank you! Wow! 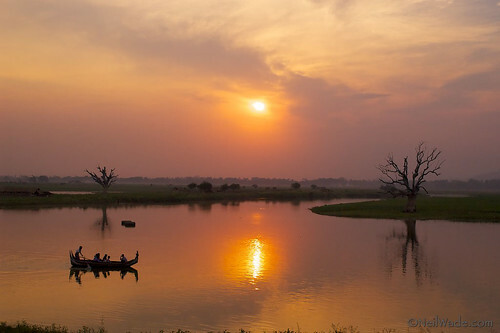 These photos make me really want to go and visit Myanmar!Is it safeto travel there currently? I didn’t know tere was so much to offer there, I think alot of South east asian countries are extremely overlooked in America….these pictures are goreous. It’s very safe to travel to, and very worth visiting! I was born in Maymyo Burma. My stepmother was Anglo Burmese. I was told so much about Burma, but had left there since age three. My father had been Colonial police superintendent of the Magwee district; my Uncle, his brother, was also there in the Colonial Police. My grandfather had worked as an engineer in the gold and oilfields there; my own mother caught malaria in Burma, and died in England from it. It is quite obvious the Burmese people would have been much better off if still under the British, despite what the police officer who also worked there with my uncle, Eric Blair (George Orwell) thought. Imagine, I was born in Maymyo Burma, my father, my Uncle and George Orwell all worked there doing the same job. My mother died of malaria caught in Burma, my stepmother was Anglo Burmese, my grandfather, an engineer, worked in the Burma gold and oilfields, and you won’t print what I wrote about Burma. 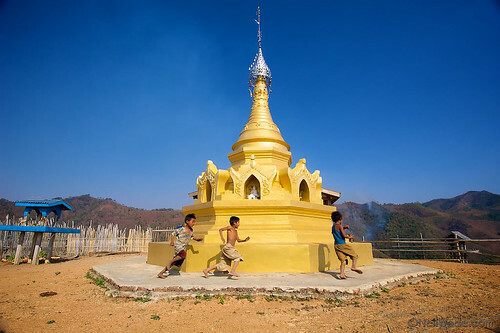 Maymyo, is a city near the center of Burma. I was born in Maymyo. I write this knowing you will get tripped up if you read my last two attempts at being posted. Your pictures are so stunning. Your scenery shots are beautiful. Thanks for sharing them. Wonderful pictures! I had the opportunity to visit Myanmar myself as a musician. We played for an amazingly enthusiastic audience and I had the opportunity to see the mustache brothers myself (“don’t tell my wife”). Really beautiful shots! It’s a testament to the human spirit to see the smiles and joy on the faces, despite the oppression and struggle the country has endured. Thank you for capturing the magic of a place that most of us will never have the privilege of seeing. I like the monkey-picture very much. I don´t know why, but there is something in the way the little monkey lies on that wall…perhaps it has something to do with the “punctum”…don´t know. Thanks for that photo. I have not overlooked your ineffable photography. You might find Emma Larkin’s 2005 book, ‘Finding George Orwell in Burma’ enlightening. She is a plucky girl to have gone in there with a book intention. Surreptitiously, she met those people in Burma she needed to find. These photos really touched me. I am a 2nd generation Burmese American, my parents left Burma in their early adulthood and I have never seen their home country. I can see why my parents have gone back so often. Thank you for sharing this. I note the lack of political images. Still a beautiful country and people–ruling elite aside. Lovely pictures needless to say! I always say ” 50%, what’s in front of the camera, 40%, who’s using the camera and 10% – the camera”. The first two percentages can be interchanged with each other. What lovely, lovely photos. The colors are gorgeous. Good, good job thanks for sharing. Congrats on being Freshly Pressed. I love the 3 Mustachiod guys, too funny!! Your pictures are absolutely gorgeous. So glad you went back 5 years too share… they definitely evoke feeling. Deeply imptrinted with yr photos . For a long time i’ve dreamed abt a trip to this misterious country . could u please share tips , introduce places to visit ? highly appreciate ! Such a nice set of beautiful pictures, and it is still wonderful to see them although I am a native. Thank you very much for sharing your pictures and experience in Burma. I have been out of there for more than 15 years and miss my family, friends, and my native country. It’s amazing that only a handful of your pictures tell so much memories, and again, lovely pictures. Your images are so great. And i really enjoyed having a tour on your website! Like yourself, i also love photography especially photojournalism and human interest. I’ve been developing myself to be professional like you. Nice set of pictures Neil! You really captured the friendly personality of the Burmese. I went to Myanmar about 7 years ago, but didnt take a camera with me believe it or not. Loved it tho! Didn’t take a camera?!?! WHAAATT?!?!?!?! These photos are fabulous, looks a wonderful part of the world too. An amazing collection of images. Really captures the essence of the country. You have some really cool pictures up here. 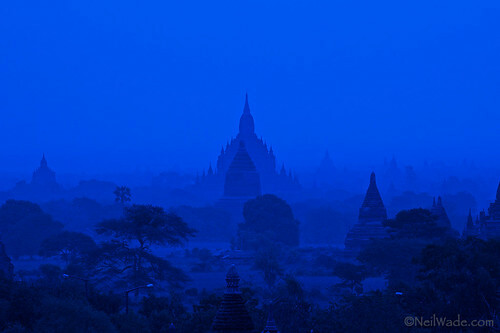 Loved your “Sunrise on the World Heritage site of Bagan” its really refreshing! Gorgeous photos! Love the one of the monkeys. Looks amazing. I think visiting other cultures/ experiencing other lifestyles is a once in a life time thing. I need to plan the rest of my travels…. Gorgeous photos, and I also really enjoyed reading the captions. The updated details were also great in helping me learn more about Myanmar. Glad you had such an enjoyable experience there. What was your light source in the jumping cat monastery? I remember it being quite dark there and I only got a half-decent shot using Neopan 1600. It looks like the guy is sitting in the light for you plus a bit of flash. Did you have him move? It’s all natural light. I don’t remember where the windows were, but it was shot with a Nikon D70 at ISO 640, f/2.8, 1/100 sec on a 80-200 f/2.8 lens. No flash was used but I did open the exposure almost two stops in Apple Aperture, then used Noise Ninja to remove the noise. I didn’t have him move. I remember a few of us sitting in a little half circle and watching as he got the cats to jump. Thanks. I did notice on a second look that the picture is a bit noisy. You did a good job in post, though. It looks like a lit image.